Pest monitoring Thrips tend to have clumped distribution both through the field and on individual plants. Thrips are active and are dispersed readily by wind. White or yellow sticky traps are useful to monitor for thrips flights. On onions, an action threshold of one to two per leaf or 30 per plant is suggested. Treatment is usually not necessary on seedlings, because most plants recover from thrips injury. 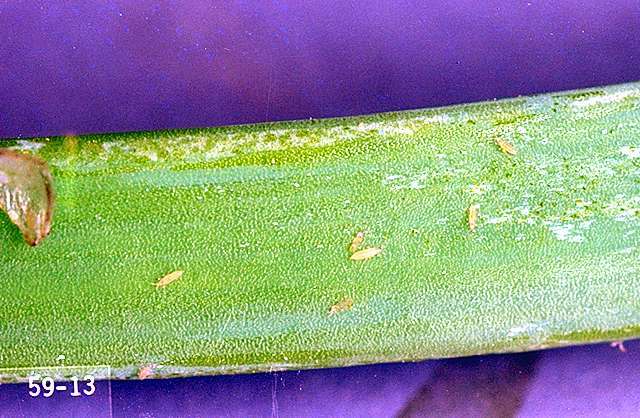 The marketability of leeks is reduced by thrips scarring. Apply treatments at the first sign of thrips feeding. Thrips also are beneficial at this time because of their role as mite predators. Sanitation is very important. Volunteers should be rogued out. Cloves used for planting should be free of contamination. Thrips populations tend to build up on weeds. Cultivating nearby weedy areas early in the year reduces the potential of a thrips problem when the weeds begin to dry out. Cultivating weedy areas after plant emergence may increase thrips problems. Overhead irrigation and rainfall provide some suppression of thrips populations, but treatments are often still necessary. Beauvaria bassiana-Some formulations are OMRI-listed for organic use. Not registered on shallots. plant-derived essential oils (such as rosemary and thyme oil)-Some formulations are OMRI-listed for organic use. acetamiprid (Assail 30SG) at 0.094 to 0.15 lb ai/a. PHI 7 days. REI 12 hr. Retreatment interval 7 days. Limit 4 treatment per year. Do not exceed 0.6 lb ai/a per season. abamectin (Agri-Mek 0.15) at 0.009 to 0.019 lb ai/a PHI 30 days. REI 12 hr. Retreatment interval 7 days. Do not exceed 0.056 lb ai/a per season. Shallots only. Burkholderia spp. (Venerate XC) at 2 to 8 quarts/a product. PHI 0 days. REI 4 hr. OMRI-listed for organic use. Leeks only. Chenopodium ambrosioides extract (Requiem 25EC) at 3 to 6 pints formulated product per acre. REI 4 hr. OMRI-listed for organic use. clothianidin/imidacloprid (Sepresto 75WS) at 0.0126 oz product per 1,000 seeds (seed treatment). Do not exceed 0.375 lb ai clothianidin or 0.5 lb ai/a imidacloprid per season. Leeks only. cyantraniliprole (Exirel) at 0.088 to 0.133 lb ai/a. PHI 1 day. REI 12 hr. Retreatment interval 5 days. Do not exceed 0.4 lb ai/a per year. Suppression only. cypermethrin (Holster) at 0.08 to 0.1 lb ai/a. PHI 5 days. REI 12 hr. Do not exceed 0.5 lb ai/a per season. Do not graze or harvest for feed. Retreatment interval 7 days. Inclusion of MSO or COC adjuvant will increase efficacy. dinotefuran (Scorpion 35SL) at 0.135 to 0.18 lb ai/a foliar or 0.225 to 0.27 lb ai/a soil. PHI 1 day foliar, 21 days soil. REI 12 hr. Retreatment interval 7 days. Do not exceed 0.27 lb ai/a per season. imidachloprid (Admire Pro) at 0.5 lb ai/a soil applied. PHI 21 days. REI 12 hr. Do not exceed 0.5 lb ai/a per season. malathion (Malathion 8) at 1.0 to 1.56 lb ai/a. PHI 3 days. REI 24 hr. Retreatment interval 7 days. Limit 2 treatments per year. sodium borate (Prev-Am Ultra) at 50 fl oz product/100 gal. PHI 0 day. REI 12 hr. spinetoram (Radiant SC) at 0.047 to 0.078 lb ai/a. PHI 1 day. REI 4 hr. Retreatment interval 4 days. Do not exceed 0.234 lb ai/a per season. Limit 5 treatments per season. spinosad (Entrust SC) at 0.06 to 0.12 lb/a. PHI 1 day. REI 4 hr. Retreatment interval 4 days. Do not exceed 0.45 lb ai/a per crop or make more than 5 applications per year. Suppression. Entrust SC is OMRI-listed for organic use. spirotetramat (Movento) at 0.08 lb ai/a. PHI 3 days shallots, 7 days leeks. REI 24 hr. Retreatment interval 7 days. Do not exceed 0.16 lb ai/a per crop season. zeta-cypermethrin (Mustang) at 0.0375 to 0.05 lb ai/a. PHI 7 days. REI 12 hr. Retreatment interval 7 days. Do not exceed 0.25 lb ai/a per season. Pesticide resistance management Resistance to organophosphate has been documented in several states and is suspected in California. For this reason, alternate insecticides from different chemical families when multiple treatments are needed during a year.